It's that time of year again - the 3rd biggest stage race in Pro Cycling! Can't wait to see FRANDY Schleck, Evans, Basso and others battle it out in ..... Colorado?! Who is racing the "traditional" 3rd biggest Grand Tour? Nabali is there and others GC guys like Menchov and Sastre. Sold yet? Cav and Boonen are there, but that only draws attention to the flat stages. Webcam of Contador watching the Vuelta on TV from a bunglo in Fiji. 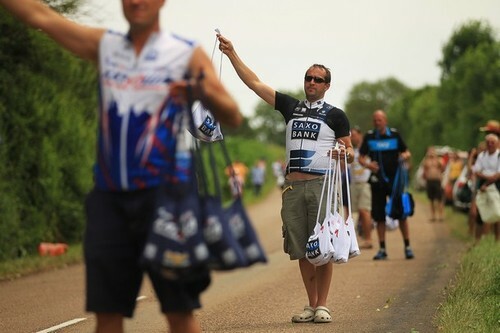 As he does things like send a text message or drink a fruity umbrella beverage it would be considerably more exciting than watching Carlos Sastre go all out on a climb. He might give the camera the occasional Pistolero or go swim with some dolphins to spice it up "Muie quinte!" Due to the location and time of year, snow can't be a factor in creating must watch TV. 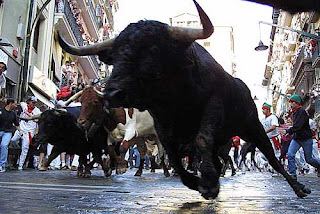 So leverage something this country already has down - the running of the bulls. Let the bulls lose from a side alley as the peloton has 5k to go in a sprint stage. GC guys will be mixing it up with Cav to avoid El Toro! The wearer of the Leaders RED jersey will drop some serious watts to save himself. Let Rock Racing Team 2 in with a last minute "special invitation". Skull kits, Lambos, and strippers will lift ratings and add to the road side party! You would hear comments like this: "I just caught a bag of Haribo candy from the caravan!" "Who cares, I just got a lapper from that Rock Racing chick, Saphire!!!" Carlos Sastre & Denis Menchov should be required to ride handcuffed together. Apart these two are liking watching old men play chess in the park...chained together, they are way more interesting. Hire Joe Rogan to host Feed Zone Fear Factor for fun like this: Announcers in the booth,"A Crash near the feed zone, wonder what caused it?" Joe Rogan, "Looks like Beñat Intxausti Elorriaga got a scorpion and a bull dong in his feed bag." While we don't love the Spanish Cycling Federation, Spain is a cool country. We also respect the history of the race, and hope it moves on the calendar or does something to lure the top talent back. * We'd like to state one more time that we wish Levi would go back and ride the Vuelta and win the damn thing! He has finished 2nd and 3rd and could stand on the top step if he made this his focus for the season. Like it or not, the Vuelta has more history in the sport than ATOC and winning it would make his career. Thanks for reading! Check out our cycling tees www.hbstache.com and use PROMO CODE: VIVACO for 25% off (excludes new arrivals)!